Even with all the comforts modern technology brings to a designer’s life, many of us still tend to romanticize the past. It can’t be denied that wood block printing, the Gutenberg press and sweet hand painted signs continue to project a scintillating and alluring beauty that persists despite the avalanching advancements of modern technology. Among my favorite characteristics of original vintage and retro pieces are the subtle mistakes and inconsistencies brought about by early, unrefined printing processes and of course, human error. Multiple hand painted signs and old mass printed books, aiming to be identical, had subtle variations and little quirks. These make them all the more appealing because they wound up feeling intentional and human, making each piece in a series unique and relatable. After all, to err is human and that, we are all. This fascination with the past has resulted in a love affair in the creative community for vintage and retro typography. It’s not uncommon to see branding, typefaces and even websites and apps inspired by old school styles. Whether you’re a designer working in the typography space looking to jumpstart your creative process or, like me, you’re merely a humble admirer, you’ll love our compilation of 50 truly stunning examples of vintage and retro typography. This groovy piece is done by designer Simon Walker, whose work all seems to be straight out of the past and in this case, the 70’s. Check out his Dribbble account, loaded with more retro goodness. If old Hollywood took on the form of an invitation, it would look just like this—and Jessica Hische definitely intended to do so. She paired her very own Silencio Sans with custom lettering and black and white to take us back into a film noir movie. Superscopic, courtesy of Type Hunting, is a vintage script, super dynamic and likely custom. The simple, beautiful little illustration on this envelope definitely has me wondering why we ever traded in handwritten letters for cold emails. Check it out on Type Hunting, a great archive of found vintage type. Eighty Nine by Simon Walker cleverly incorporates numbers into words. The bold serif is paired with a script and sans serif and textured to add to its retro vibe. Bisto is a meat-flavored gravy powder, popular in the UK. Robot Food took elements from its original packaging, spiced them up with golden flourishes, and added a bit of a modern touch with a black background to this tin, paying homage to the beloved brand. The Braun logo was born in 1934 at the hand of Will Münich and has since gone through two rounds of revision to arrive at the mark we all know. Today, it is an example of superb geometric simplicity and remains unaffected by the passage of time. The Jack Daniel’s label has gone through 4 iterations since its original conception, all which have aimed to make subtle changes that have helped the brand evolve without losing its original vintage feel. You can read about it in depth here. 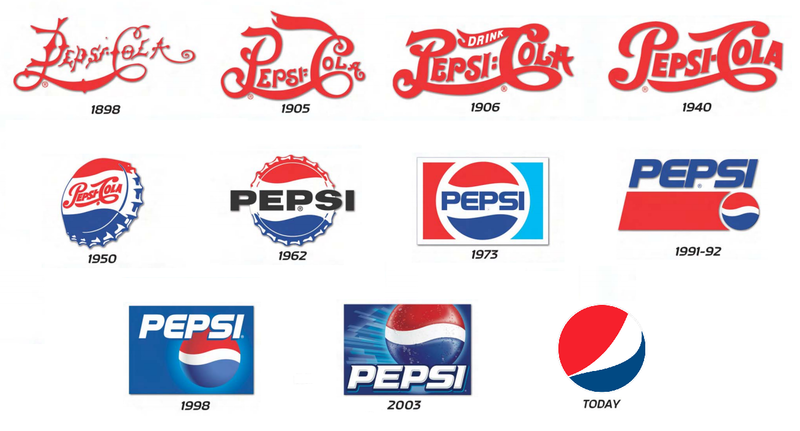 Pepsi Cola’s logo evolution gradually moved away from the beautiful, vintage script it once was and arrived at today’s seemingly smiling tricolor sphere. Maybe it is my bias towards skillfully crafted script logos but I’d likely be more inclined to chose Pepsi over Coke if I could admire this mark on its bottle. Color can also take us back in time and Empress’ color palette is no exception. The use of blue, white and black draw attention to the center of the can, the area of highest contrast, and then allow the eye to navigate the rest of the composition, easily gleaning all the info on it. Type alone did not make vintage signs and decor successful—composition had everything to do with it. The HighBall sign is strikingly simple, but makes use of color and size to achieve a dynamic and interesting sign. While Nalco, again from Type Hunting, is a finalized mark, it can serve as a great reminder to always design in black and white first and add color later. This mark needs nothing else but it is masterfully laid type to be interesting. An inspirational quote by Jessica Hische, set with flourishes and energetic retro type treatments. May have developed a design crush here but Simon Walker just keeps hitting it out of the park. The logo, created for a photographer and displayed on a matchbox, is interesting considering candles were used in very early experiments that lead to the development of cameras. This awesome kit has vintage written all over it, from the type to the colors to the very classic drink brought back by Mad Men which it allows you to make. Concarneau is one of France’s most important fishing ports, depicted beautifully in this vintage illustration. The orange and blue tones are characteristic of vintage pieces and create a subtle visual tension that is rather electric. 17. Hen’s Teeth Tattoo Co.
Mateusz Witczak created a series of pieces revolving around tattoo parlors. He loaded them with intricate line work commonly seen in old school pieces, and set them in black and gold. Although they were published in 2015, they certainly appear to be from a time past. Check them all out here. Inspirational quote by Simon Walker, featuring beautiful, retro ligatures. Today features awesome ascenders and descenders, common elements of retro and vintage typography. Wensky Malina is a hand drawn, retro logo with excellent ornamentation designed for a line of fruity beer. The script seems to have time traveled to land on the company’s bottles today. Monograms are motifs made of overlapping letters, usually the initials of the individual or business that bears it. They were widely used as signatures and first made an appearance around 350 BC. They have a habit of translating into beautiful, elegant marks that remind us of wax seals and vintage decor. Static coffee is handmade just like its mark, featuring a custom piece of lettering. It is dynamic, like retro scripts, and uses a monogram for a secondary mark. Shark Week is hardly a thing of the past and possibly the most exciting week of the year. Yet the designers creating poster pieces for it decided to go with a retro vibe, using rounded corners, a limited palette, and simple fin illustrations. Vintage pieces, like the one above, did an excellent job of combining a myriad of different typefaces. The pieces, far from chaotic, resulted in attractive, balanced compositions. 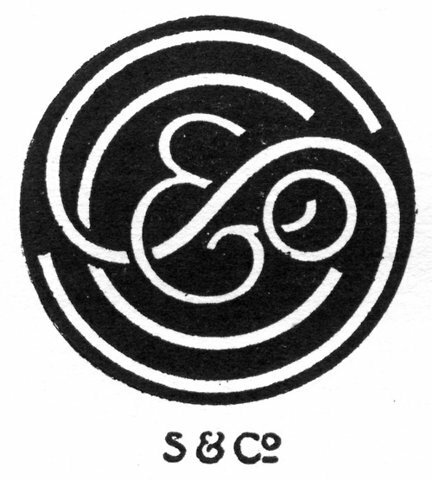 S & Co. is another fantastic example of monograms and how using them will give your projects an old school, elegant feel. Simple, friendly illustrations were common components of vintage pieces. This Nasa poster is featured at an interesting time, considering their latest announcement. Wilson Sport’s red shape adds interest to this old racket, by alluding to one of tennis’ most important elements: a ball. Beautiful piece that Jessica Hische created for The Atlantic, inspired by stencil work on old whisky barrels. A great reminder that inspiration comes from all and unlikely places and combining finds can yield excellent results. Another great example from Type Hunting of how designers of the old days use to make excellent typeface pairings and would build a straightforward palette, resulting in seemingly effortless branding. C.F. Sauer produces condiments and seasonings, among them the Duke’s line. The classic script mark has seen little change with time and is still perfectly recognizable on its packaging today. The coffee industry is experiencing a movement that is taking it back to its roots, as single brew coffee and old school roasting methods continue to make a comeback. It only seemed fitting for Slingshot Coffee Co. to look in that direction for inspiration when creating its new brand. Mad Dogs compliments its retro mark with plaid, giving it a vintage vibe with a punkish twist. This friendly vintage Sprite advert showcases 3 common techniques of the old: a monotone palette, custom type and quirky illustrations. This piece is part of a series of insurance maps created for each state in the USA for Sunburn Insurance. Its use of fine line work, flourishes, and type skewing all help create a vintage vibe. Porter’s Liniment Salve is an awesome example of type skewing, a common way to manipulate typography used on old pieces of packaging, branding and logo design. If the IRS used stamps and paperwork as beautiful as this one, the tax subject would be a lot less painful. Virtuola Handmade Cigars’ mark feels sporty, featuring custom type reminiscent of pieces we see today in sports banners and apparel. This poster makes use of repetition, another principle commonly used in vintage design, to take us back to the golden days of air travel, featuring carriers like Pan Am. A little part of what must have been a ticket to a play or show. Stark and beautiful. Vintage and retro branding is particularly popular in the alcoholic beverage industry and within it, within the whisky niche. Darkness Whisky uses fleurons, eye catching black and gold and vintage inspired type to create an elegant label. Anyone that has been to New York City will likely be able to recall this gorgeous menu. Balthazar Bakery, known for its awesome baked goods and brunch, is part of a network of restaurants, all featuring branding inspired by days of old. Americano by Opus Nigrum makes use of beautiful, subtle imperfections, common in retro handmade type, to create an expressive typeface excellent for vintage inspired branding. Bib & Tucker did not only use the days of old to inspire its look but also to inspire its name, old slang used to describe your finest apparel. Beautiful little piece that makes excellent use of ornamentation and decorative elements to give this seemingly etched little box an antique feel. Textured typeface inspired by the old days of baseball and completely hand drawn. The typeface, available for purchase, is packed with great extras, like illustrations, excellent for a new sports line. A stark, simple layout with typography beautifully laid on a grid. Air France created a series of posters, all great sources of inspiration. Neat poster featuring one word set in a variety of ways, all referencing typographic styles of the past. Simple, geometric shapes in different colors can be an excellent way to give posters a retro feel, masterfully illustrated in this piece. American Rose, another striking piece by Jessica Hische, was inspired by the grandeur of the roaring 20’s. 50. The Miami Cocktail Co.
One last stunning piece from Simon Walker to bring our list to a close. There you have it, folks. 50 stunning examples of vintage and retro typography complimented with a variety of other awesome linked sources for inspiration to get your creative juices flowing.